When it comes to 2D Platformers it seems most people, not undeservingly, think of either the 8-Bit or 16-Bit consoles, and we’re still seeing games with them in mind coming out these days. Yet it feels like things are skewed a bit toward the former, with fewer games designed with the later console era in mind. I’ve nothing against the classics but I grew up more with the SNES, so it’d be nice to see a few more games in that later style. Fox n Forests is on example of that, and a decent one. You play as Rick, a fox looking for his next meal who encounters a bird looking for aid, as something has happened in the forest to put the seasons out of sorts, and they need a hero who can set things right. Rick is all too happy to oblige – after all, then he’ll have a reward and dinner. Bit of a scoundrel, Rick is. In any case, he’s still the hero, and to save the day he’s given a crossbow and the ability to change the seasons if need be. 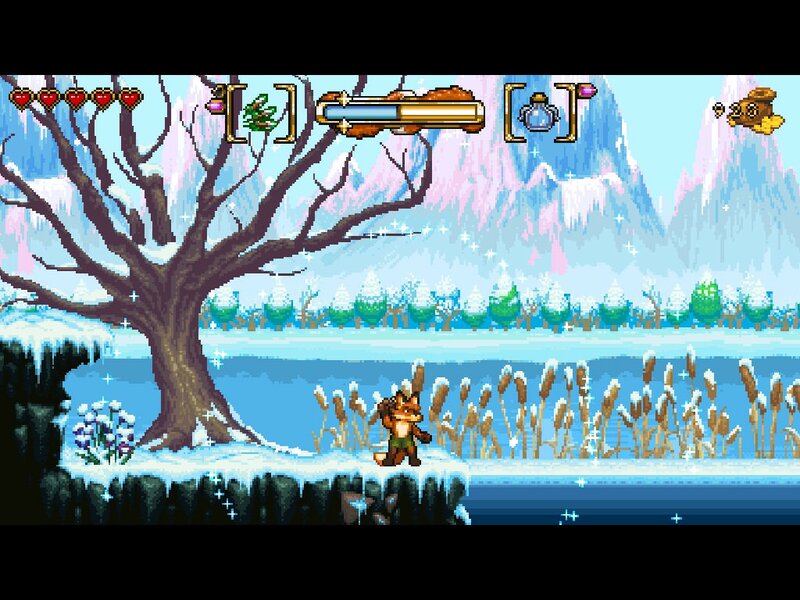 This forms the game’s main gimmick, as many times you’ll need to change from say, Summer to Winter in order to cross water that will freeze over, or to Fall in order to make falling leaves appear as platforms. There are only two seasons to shift between for each level though, so it’s not as complicated as it sounds, but you’re also under a timer, as shifting seasons drains your energy bar. Since most of the time you have to switch to get over pits or past hazards, that means you can’t dilly-dally. Aside from that, the gameplay is standard, but well-done. Rick can shoot with his crossbow obviously, except for when he’s crouching or jumping, where he’ll strike out with the bayonet. That might sound annoying, but most enemies are fair in the game, having clear patterns or moving slowly if they do pop up suddenly. You can also take a decent amount of punishment, so while the title seems to evoke Ghosts n Goblins it’s not nearly so punishing. The offered levels of the game are fairly big and expansive. While the objective is just to get to the end, there are a lot of optional paths and secrets to find. Some of these just reward you with money, which you use to buy upgrades in the hub level, but others lead you to Seeds, which you need to collect to unlock new worlds, and other collectibles needed to purchase upgrades for your bow, as well as health and magic. The only wrinkle there is that you can’t get all these upgrades your first time through each level, as many are gated off behind upgrades. After every boss you’ll gain a new element you can fire from the crossbow, which triggers targets of that color to open paths, and before then you’ll just need to walk past them. This means there’s no way around going back into levels to find more of the seeds. While I don’t mind this, it could be a turn-off for some. Every world has a bonus level you can visit if you find all of the seeds, serving as an extra incentive to look for them. Each world has two main levels, followed by a boss. These lean more toward the puzzle side of things, befitting the game’s slower pace, and all involve switching Seasons to beat them. They’re nothing too complicated, but still satisfying to beat. 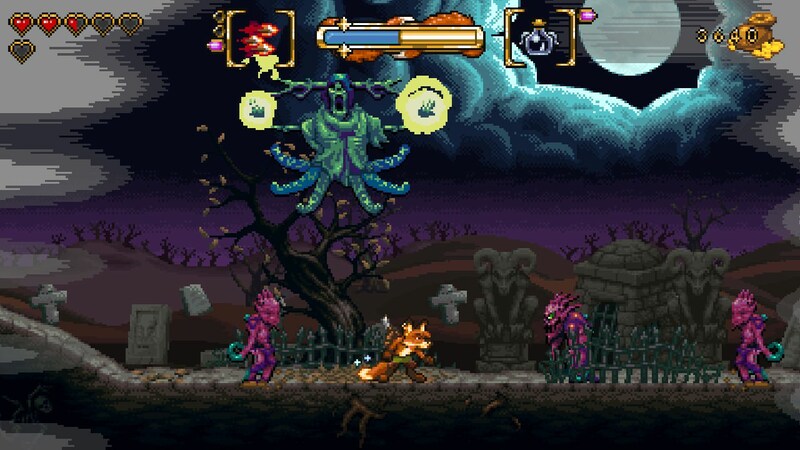 Aside from the gameplay, the game’s spritework has to be praised, as it definitely lives up to the 16-bit inspiration. Rick himself and the enemies you encounter all have some nice animation, and the backgrounds are particularly pretty, showing things like the setting sun in the distance. The game also has a lot of variety in its environments; from a lake-side area full of spinning water-wheels, to a cliff area dotted with caves, to even flying above a raging forest-fire. 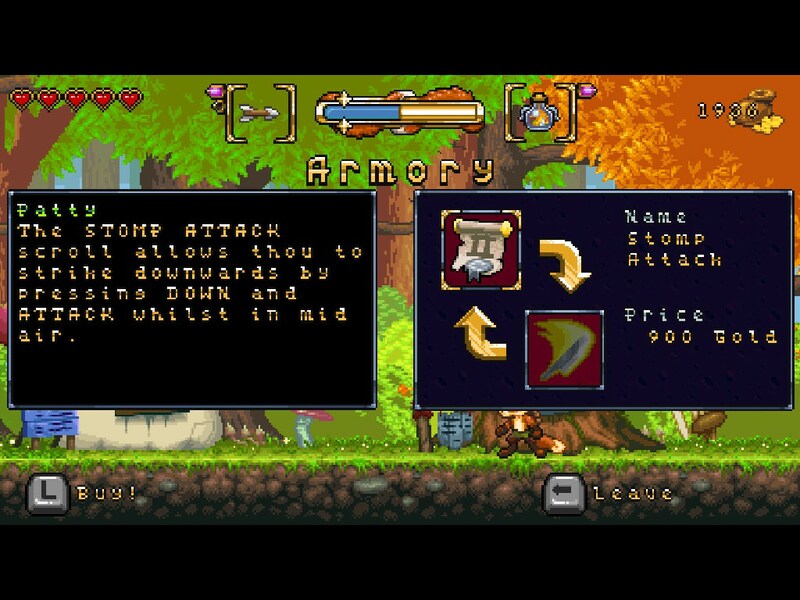 The seasons changing also means each level needs to have two versions done, which is a commendable effort. So far I’ve completed three worlds in about four and a half hours, counting time spent going back getting the seeds. I haven’t gotten to any of the bonus levels, but if they’re anything like the main ones I think that’s a good reward, and some seeds can be challenging to find. 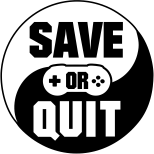 Whether it is long enough depends on how long you think a game should be, but I think it’s just long enough for a platformer. Fox n Forests succeeds at what it sets out to do for me. It’s a game that feels like it could have been on the Super Nintendo or Genesis, and it’s a well-designed platformer to boot. I give it a firm save.